Lovely A-Frame home with wrap around deck & 2 patios. Quiet, private lane. Excellent composition roofing. 2 1/2 acres currently in lawn. UG sprinklers on entire acreage. 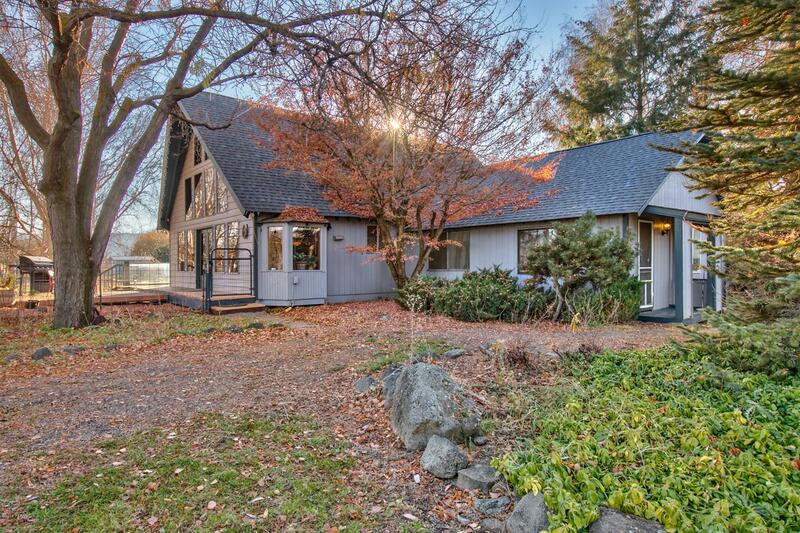 4 bed, 2 bath, family room; Propane stove in living room; wood stove in family room. ADT security sensors throughout. RV pad on west side (originally set-up for mother-in-law mobile home with own water and septic). RV pad has own electric meter. New steel, fully insulated 36x24 garage/shop; dedicated 110 outlet. Automatic garage door opener. Circular drive way. Additional 36x24 concrete pad. Private well. Dishwasher included & Maytag range included. (West side of acreage could easily accommodate horses; electricity and water handy for adding small barn/pad-dock).